What if you could change the temperature of your favorite worm and watch it as it happens? 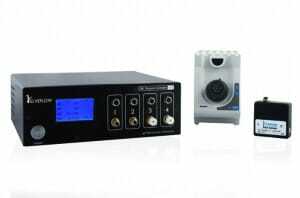 With Elveflowtemp you can combine our ultra fast temperature controller with high-resolution imaging. It allows you to both heat or cool your samples from 5 to 45°C, switch temperature in seconds and it fits perfectly in any microscope settings. 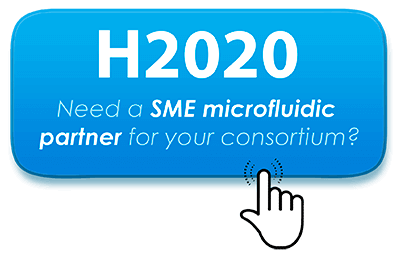 With ElveflowTemp be at the forefront of your field, fasten your scientific publication and your research’s impact. Need advice to have rapid control of TS mutant activity? Pioneer work in C. elegans genetics and developmental biology has been initiated by Sydney Brenner, 1974. Taking advantage of the worm small number of cells, Sulston and Horvitz (1977) initiated thorough cell lineage analyses. 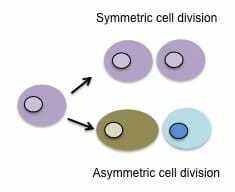 Forty years later, scientists can precisely document every single cell fate and genealogy cell tree (see figure) have been established. 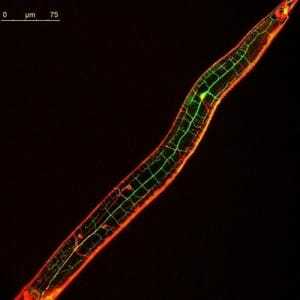 The development of new techniques enabled scientists to screen more easily for temperature-sensitive C. elegans and by shifting temperature from permissive to sensitive background, precisely question the role of protein, and its absence thereof, during development, cell division, neuron formation (O’Rourke et al., 2011). 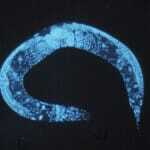 C. elegans growth development is sensitive to temperature. C. elegans life cycle is composed of 4 larval stages (L1 to L4) and an adult stage. 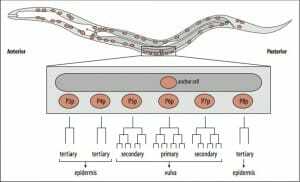 The developmental length of the worm life cycle is temperature dependent. Indeed, if embryos are grown at 15°C, the adult stage is reached in 6 days, while at 25°C it fully develops in 2,5 days. When environmental conditions are not favorable, notably at high temperature, L1 and L2 larva can enter the Dauer stage, which is defined as a dormant stage, but is in fact actively maintained with, among other metabolism related protein, high level of heat-shock protein 90. Thermo-sensitive mutants and temperature shift experiments were performed to study the role of Daf genes mutations in this pathway unraveling the role of insulin-like and TGF beta pathway in this particular C. elegans stage. 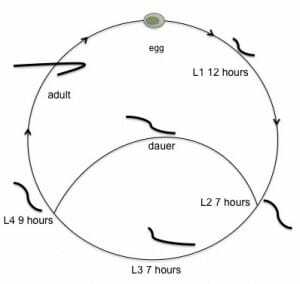 C. elegans aging is also sensitive to temperature (Klass 1977), when grown in liquid media C. elegans life span is of 23 days at 16°C and 9 days at 25°C. This property has been linked to the role of clock genes (Clk). While wild-type worm can adjust their life span to changes in temperature, Clk mutant were unable to respond to a temperature shift. 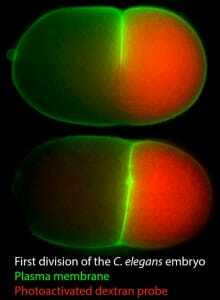 Molecular pathways linked to Clock genes and control of C. elegans life cycle is being investigated. 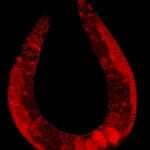 Moreover, work done by Cynthia Kenyon’s group showed that Daf genes are also involved in worm lifespan and Daf mutations increase the longevity of C. elegans. 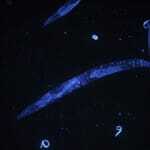 Alzheimer, Parkinson, ALS (see above) and Huntington’s diseases are being studied in C. elegans (Li and Le, 2013). Both in ALS and Huntington’s diseases, it has been shown that temperature-sensitive mutant genes can act as modifiers to proteins misfolding and aggregation toxicity. 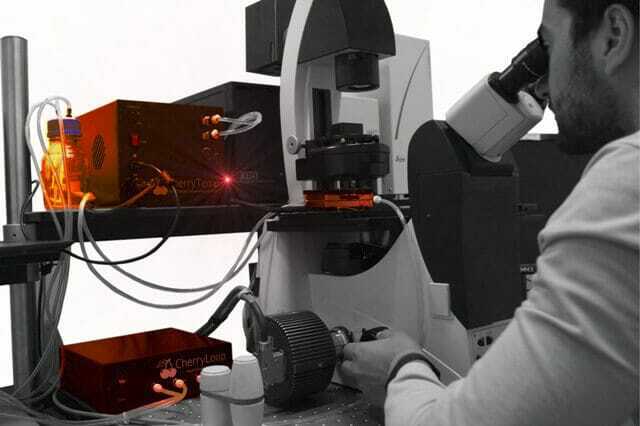 Hence the possibility to combine live-cell animal imaging with rapid temperature shift from permissive to restrictive temperature is very important. With our temperature controller, you can watch GFP-tagged mutant protein aggregation concomitantly to the mutant phenotype induction. ElveflowTemp allows you to rapidly screen through temperature phenotype effects. With ElveflowTemp, you can shift from 5 to 45°C in seconds and uniquely test control and mutant conditions on the same worm. Given the numerous aspect of C. elegans that are controlled by temperature changes, the availability of ElveflowTemp temperature controller is broadening your experimental perspective. ElveflowTemp can be used both for embryos or adult worm studies. Until now, looking at early onset protein response to fast temperature change with live cell imaging was not possible due to the lack of adequate device. ElveflowTemp allows you to do it. If you are working with temperature-sensitive mutant and looking at cytoskeleton assembly, you can now go from permissive to restrictive temperature and watch the early-onset response of your favorite fluorescent-tag protein. If you are working with fancy hsp driven genes, then you can fine-tune the expression of your genes while recording the effects with imaging. And if you are interested in developmental pathways, you can induce entry or exit of Dauer stage and record the effects with microscopy. Alternatively you can submit your larva or favorite temperature-sensitive worm to several cycles of up-shifting and down-shifting temperature to test the tolerance of a particular pathway to several temperature variations. 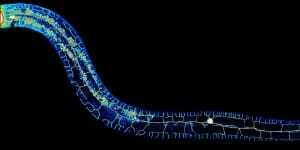 Need an accurate heater-cooler system to control thermo-sensitive C. elegans ? Need a fast drugs switch system for your C. elegans studies ? Heesun Kim, Takao Ishidate, Krishna S. Ghanta, Meetu Seth, Darryl Conte Jr.